Remember Mitt Romney? That fellow who ran for president a few times? Well, his wife got him a Mustang Convertible in 2005 as a gift. But Mitt just traded it in, not for a new GT500, but for an Econoline van. Cool? 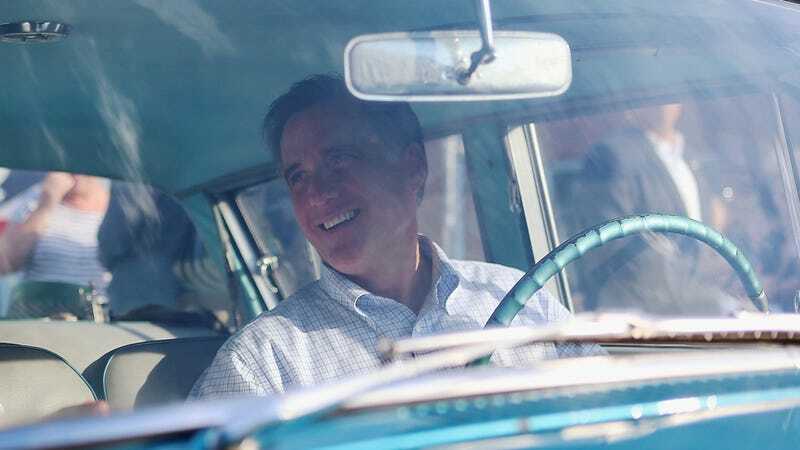 Romney traded in the Mustang the other day for the Econoline. He didn't publicize that he was doing it or anything, he just showed up. Probably because he didn't want people to know he was turning in his pony car card to become a van man. The trade does make sense. Romney has enough people in his family to form his own sovereign nation, so the big Econoline should help transport them across borders easily. And I'm not going to knock a big van. When I was racing karts, we used a 15-passenger Ram 350 van to get the karts to the track. Although I doubt Romney is using the van as a race support vehicle, it is a useful way to get a battalion of people from point a to point b. Still, why trade in a Mustang for it? Why not one of the other cars in his garage? He surely has so many others.